POTATOES PACK A HEALTHY LUNCH PUNCH! 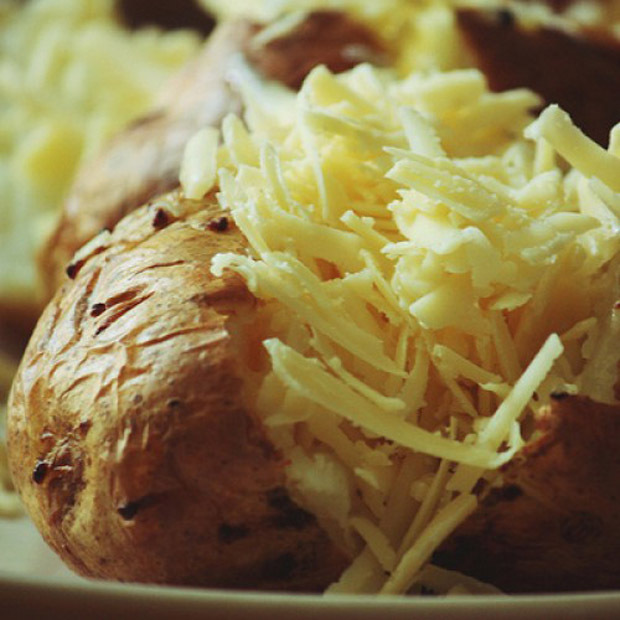 Whether you’re a superfood disciple or simply looking for a filling, healthy lunch you can’t go wrong with a humble jacket potato. It’s probably fair to say that potatoes have taken a bit of a mashing in the recent ‘low carb’ years, but both regular and sweet potatoes are not only delicious, they’re packed with valuable nutrients and fibre. And nothing beats fibre when it comes to digestive health – as well as helping to prevent colorectal cancer, it keeps you regular and leaves you feeling full between meals. Both regular and sweet potatoes pack a real nutritional punch, being among some of the most potassium-rich foods. Bursting with vitamins and minerals, potatoes are most definitely good for you, helping to keep blood pressure in check, bones healthy, metabolism on track and the immune system in tip top condition. Believe it or not they’re low in calories too – as long as you take it easy on the toppings! Interestingly, regular and sweet potatoes are botanically unrelated. While ordinary potatoes are related to tomatoes, peppers and aubergine, sweet potatoes are from quite different family. And unlike regular potatoes you can eat the leaves of sweet potatoes. While both varieties of potato originated in central and South America, it’s a fact that there are about 4,000 known varieties of regular potatoes and around 5,000 varieties of sweet potatoes in the world, with both types of potato coming in a rainbow of colours from white to orange and purple. So, with such abundant health benefits it should come as no surprise that here at Expresso we’ve added baked jacket potatoes to our menu. With both regular and sweet potatoes available, customers can choose from a range of toppings – including cheese, chilli, beans and tuna. All now available to eat in or take-away. And they’re gluten free too remember!